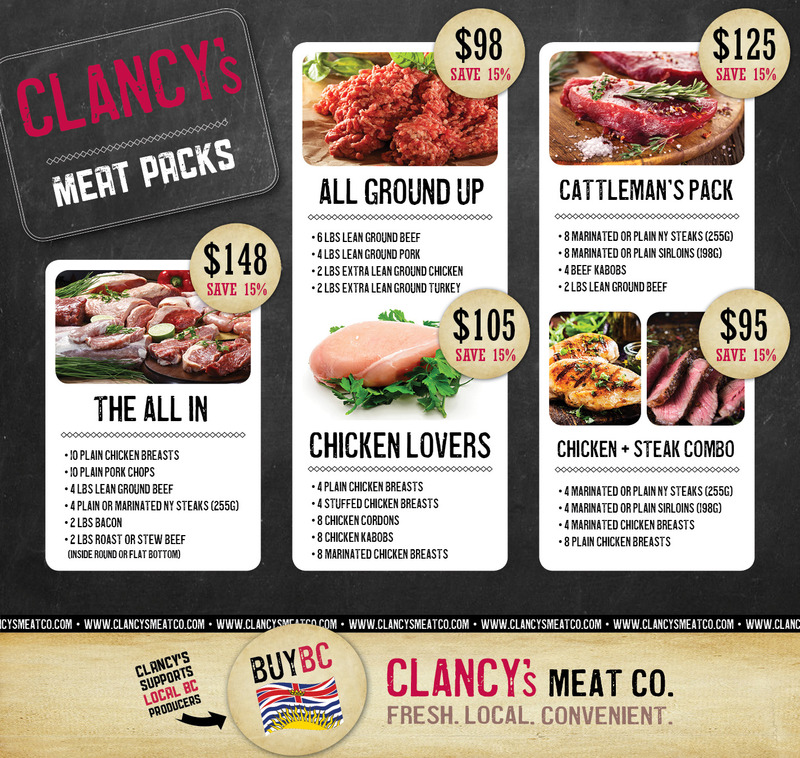 WELCOME TO CLANCY'S MEAT CO.
Clancy's is proud to serve our communities from each of our individually family owned and operated locations throughout British Columbia. Providing fresh and frozen meat products, and ready-to-eat meals inspired by the west coast, we continue to craft recipes that reflect our passion for providing a memorable dining experience for our customers. Clancy’s is a British Columbia (BC) owned and run business. Our mission statement is to provide the best and highest quality meats and products, locally sourced in BC whenever possible. Fresh. Local. Convenient. This is the Clancy’s Experience. Clancy’s has a set of core values that guides our business. Buy Local is a cornerstone: Clancy's is proud to source our high quality products from local producers. We take pride in supporting the farm-to-plate movement ensuring the freshest products possible for you and your family. CLANCY'S WEEKLY SPECIALS - SIGN UP NOW! BUY BC! Clancy's is proud to support local trusted BC farmers and vendors for all our products. We are proud members of the BC BUY LOCAL Program (bcbuylocal.ca). That means our meats and poultry, seafood, ready to heat-and-serve meals, and desserts are all sourced proudly from close to you, by family owned and operated farms and businesses. This reduces your carbon footprint, helps to support the local economy, and ensures the freshest possible product gets onto your table! Clancy’s guarantees customers that all of our products are the highest of quality, and meet the strictest standards within the food industry. We work with our suppliers to ensure that all facilities are federally inspected with regular monitoring; this gives us confidence in the consistency and safety of our products. Clancy’s offers customers a full money back guarantee if a problem arises, and will work diligently to correct the issue. Your satisfaction is our number one priority! Clancy's strives to provide our customer's with locally sourced poultry, meat products, fish and ingredients used in our prepared foods. Our chicken free-run and is sourced from our local farm supplier; our beef is Certified Angus Beef raised without antibiotics or hormones; the ingredients in all our prepared foods and fresh from our local partners. This ensures high quality meals for you and your family! 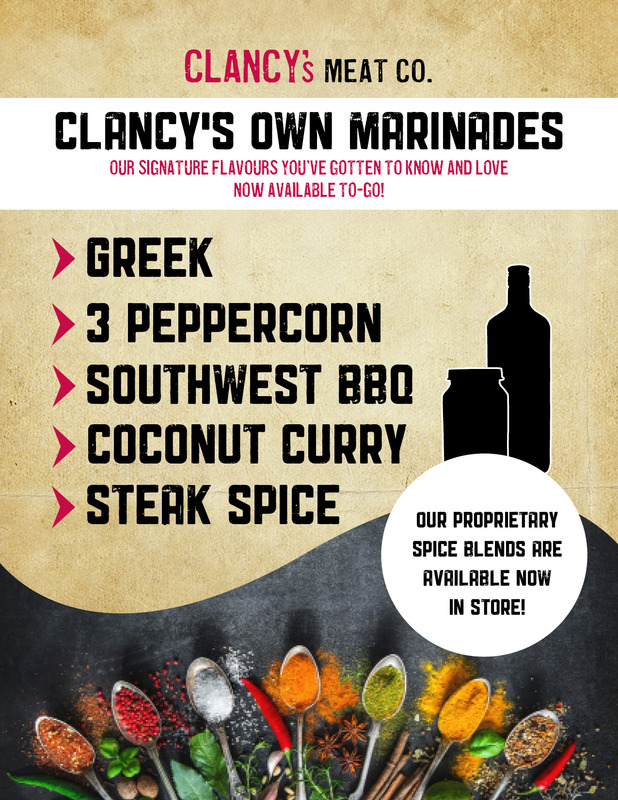 Clancy's is unique in that we create our marinades and prepare our ready made and frozen meals in house using proprietary recipes and ingredients exclusive to Clancy's Meat Co. Learn more about our marinating process and what makes us unique here! "Our Mission Is To Provide Our Customers With Healthy, Unique And Delicious Meal Options"
All our ready made products are prepared fresh daily using the highest quality, locally sourced ingredients. Our meats, poultry and seafood items are all inspected and selected according to the highest standards. Our staff are experts - whether you need ideas for dinner tonight or want to know what temperature to cook a steak to, we can help you! Clancy's products are ever changing according to seasonailty in order to provide our customers with the freshest possible product and ingredients. We always put the customer first, with convenience for our customers being our ultimate goal. We want to make preparing dinner as easy as possible for you and your family! Our features are ever changing and vary with each season! Check in with your local Clancy's Meat Co. to see our Wednesday and Weekend Features! "Incredible selection, quality, and prices and exceptional customer service. I come from another town just so I can come to this location!" Rachel G, our customer (via Facebook). "Always a wonderful shopping experience. The guys working there remember you by name! The service is excellent, they give you advice on any meal brainstorming you may need, often have great deals, and the quality is second to none with healthy hormone free, grain feed meats. Couldn't ask for anything more!" H.G., our customer (via Yelp). "Awesome food, selection and service. We always go for the $20 steak dinner for two. This includes 2 marinated steaks (I like their southwest), 2 double stuffed potatoes, 2 prawn skewers, and 2 stuffed mushroom caps." Jason M., our customer (via Yelp).